A series of temporal anomalies have altered the universe, merging, past, present, future, and mirror timelines all into one. 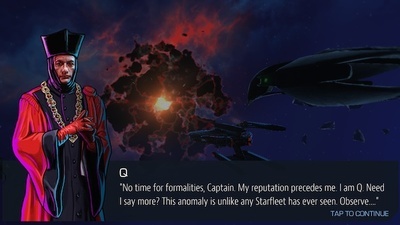 Work with Q to investigate these anomalies, and learn how you can bring order to chaos. 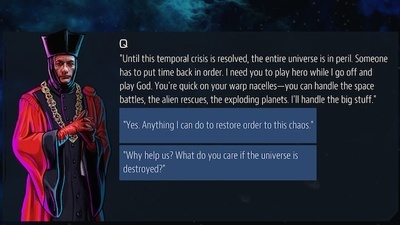 When I loaded Star Trek: Timelines for the first time, and heard John De Lancie as Q, giving the narration, my hopes for the game soared. It is always a bonus when you can get the original voice cast as it gives the game authenticity. 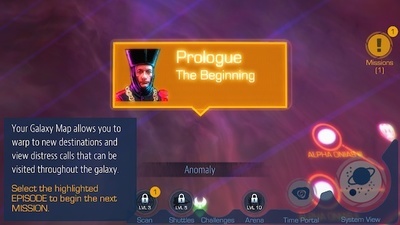 All the other character voices in this strategy game are also those of the original actors, although these are simply recycled quotes from the television series. 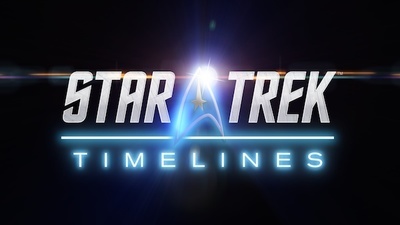 Star Trek: Timelines allows players to experience every series of the franchise, by merging past, present, future, and mirror universe together. That means, every fan can enjoy the game, no matter which series you prefer. 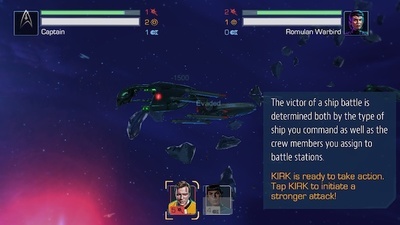 The basic gameplay of Star Trek: Timelines involves you going on missions either with an away team or in a space battle. 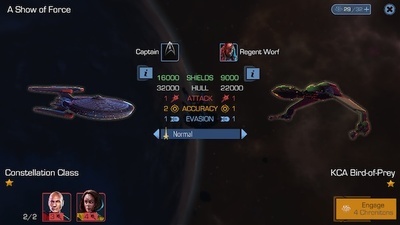 These missions are a collaboration with other factions, such as the Klingons or Augments. It is up to you to decide which members of your crew to send on an away mission as they all have different skill sets. By sending them on missions, they increase their level and proficiency. You can also improve their skills by equipping them with items that you earn along the way. 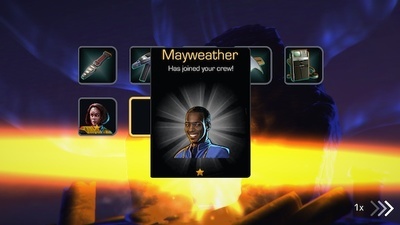 Using in-game currency, such as dilithium, also allows you to unlock new items, characters, ships, and upgrades. There is also a chance to visit the Guardian of Forever for some bonus items. 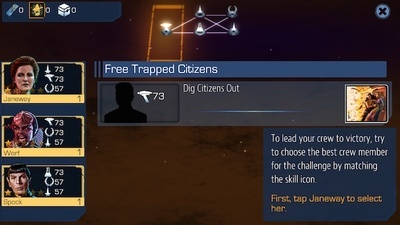 You can take three people on an away mission and there are three courses of action that you can choose to take. Depending on your crew's skills, these actions will either be easy, moderate or hard to achieve. 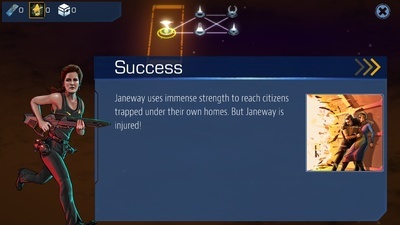 As away missions are text based, there is a lack of action, and they do become repetitive after a while. Space battles are a bit more dynamic, as you can see the ships firing on one another. The graphics in these sections are beautiful and very high quality. Don't make the mistake of just watching though, as you can improve your chances of a swift victory by commanding your crew to take certain actions, such as evasive manoeuvres. Once a mission has been completed, your allied faction will hail you for a conversation. You will then be able to choose your response. This idea has great potential, but unfortunately it is not utilised. I would have loved each response to result in a different outcome/path taken in the game, but no matter how you answer, the end result will always be the same. 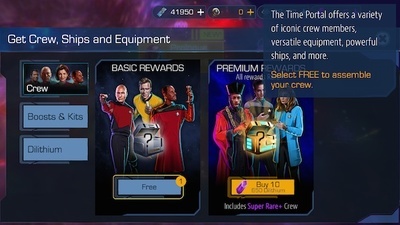 Star Trek: Timelines has the initial novelty factor that will keep you entertained for a few hours at the start. After completing Episode 1, however, I began to get bored with its repetitive nature.